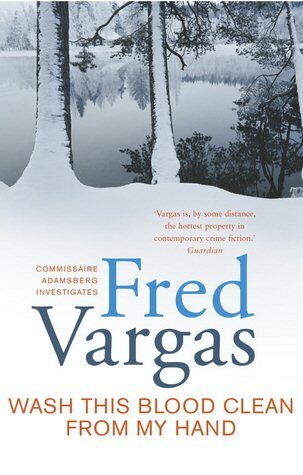 WASH THIS BLOOD CLEAN FROM MY HAND is the fourth Fred Vargas novel to be translated with last year’s offering, the non series THE THREE EVANGELISTS, winning the inaugural International Dagger. WASH THIS BLOOD is the fifth in the Superintendent Adamsberg series though mysteriously the first and fourth in the series haven't yet been translated. WASH THIS BLOOD finds Adamsberg and his team preparing to leave Paris for a trip to Quebec to receive training on DNA profiling. Adamsberg's right-hand man, Danglard, is dreading the journey convinced that a bird will fly into the engine and the plane will nosedive into the Atlantic. Also going is Retancourt a strapping officer who can turn her hand to anything. A few days before they set off Adamsberg begins to act strangely, as if 'a stowaway had slipped into his head and taken charge'. Adamsberg eventually traces the source of the discomfort to a newspaper article describing a murder of a young woman. Adamsberg recognises the MO of the killer, three stabs in a horizontal line, as that of a serial killer he had been tracking for many years until the killer's death some sixteen years ago. How can a dead man kill again? Adamsberg had pursued the killer he termed 'The Trident', a man who had lived in his village when he was growing up, across France until the man, the untouchable Judge Fulgence, died. Not surprisingly the police in charge of the case refuse to take Adamsberg seriously and besides, as was the usual case in The Trident's killings, there was fall guy lined up. So, the trip to Quebec begins. Adamsberg likes to walk and after the training has finished for the day he walks to the nearest town along the Portage trail where he meets a slightly odd young Frenchwoman, Noella, with whom he begins a relationship. Noella takes their affair more seriously than Adamsberg intends and she threatens to join him on the plane home. However when she doesn't turn up he is relieved. That is until a few days later when he is lured back to Quebec under false pretences and accused of her murder. She has three short stabs across her stomach, the mark of the Trident. Adamsberg needs all the friends he can find to clear his name and to get him out of the country to lure out the real killer. The wrinkle is that Adamsberg had been drunk the night of Noella's death as well as knocked out by a tree branch and cannot remember what he'd done. He worries he could be guilty. It's a bit disconcerting to have a policeman who almost believes he did murder someone. Fortunately his friends believe in his innocence. As usual with Vargas the characters are quirky in the extreme. As well as Danglard and Retancourt there is also Clementine, from HAVE MERCY ON US ALL, who insists on fattening Adamsberg up, and her lodger Josette an eighty-plus computer hacker of extraordinary skill. In a more 'normal' police procedural the mystery behind a 'ghost' still murdering people would be solved somewhat quicker but that wouldn't fit in with Adamsberg personality and his fertile imagination. Having been told he has the ego the size of Strasbourg cathedral, he proceeds to mentally stuff people and animals into it. It takes him ages to believe there may be a prosaic explanation as to how The Trident could still be in action. "Adamsberg came across Violette Retancourt at the coffee machine. He stood back, waiting for his heftiest officer to take her cup from the machine's udder - since in his mind the drinks dispenser was a kind of dairy cow, tethered inside the Crime Squad's offices, like a silent mother watching over them all, the reason he was so fond of it." …and it's a real shame when the book ends. I don't think this tops THE THREE EVANGELISTS but it will be on my list of favourite reads of the year. Read more reviews of WASH THIS BLOOD CLEAN FROM MY HAND here, here and here.